What is the Sikh attitude to inter-faith marriages? Marriage is about two bodies walking ‘one path’, not ‘two paths’. In order to have a Muslim marriage, the Nikkah, both man and women should be Muslim. In order to have a Christian wedding at a Church, most Christian Churches would expect the couple to be both Christian and some even attend Church to show commitment to the faith. The same goes for Jews. However, when it comes to Sikhs, it seems the media and outsiders feel it justified to criticise Sikhs for only allowing Sikhs to partake in the Sikh religious marriage ceremony in the Gurdwara. The usual reason given for a Sikh and non-Sikh to get married in a gurdwara is that the Sikh wants to share the occasion with friends and family. A more flippant reason sometimes given for a gurdwara ceremony is that ‘it is colourful’. An even less valid reason is that some gurdwara management committees see mixed marriages in a gurdwara as an additional source of income. 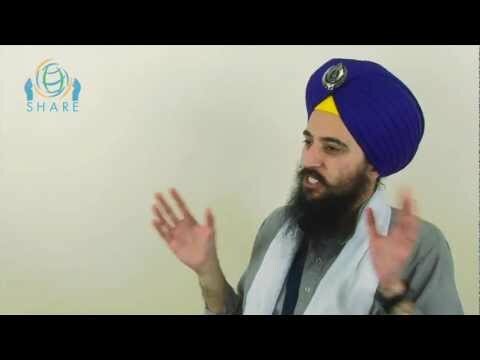 Although Sikh attitudes to other religions is one of respect, the Sikh Gurus reminded us that Sikhi is a distinct path in its own right with unique emphasis on the equality of all human beings and it’s far-sighted teachings on gender equality. Sikhs are urged to live honestly and work hard to look to the needs of their family and wider society. Sikhs see the one God of us all, the Creator of all that exists, as beyond human understanding. While Abrahamic faiths share our belief in one God, their view of the Almighty is of someone having human attributes of gender, birth, favoritism, jealousy and anger. Sikhi uniquely rejects asceticism in favour of married life. This belief is central to the Sikh marriage ceremony in which the bride and groom affirm that they will henceforth be as one in mutual support and service to family and wider society. Sikhi teaches that we should be open and honest in our behaviour, particularly in a gurdwara, and it is wrong for any couple to go through a Sikh marriage ceremony with no intention of living according to Sikh teachings as emphasized in the Sikh marriage ceremony. The four perambulations (Lavan) around Sri Guru Granth Sahib Ji are a reminder of this. Even more of a charade is the increasing practice of someone growing a bit of a beard and putting on a turban (Dastaar) for the marriage ceremony and then immediately discarding the turban and shaving for the reception often at the same premises on the same day. So what should our community do in the case of someone set on marrying a person of another faith and wishing to preserve their ties with the Sikh community? It would clearly be against Sikh teachings to shun them. It would be equally wrong for the Anand Kaaraj ceremony to be debased by pretence. One way of meeting this dilemma would be to have wedding service in a Registry Office, followed by a reception for friends and family of both parties. The long term solution is to ensure that Sikh children grow up fully understanding and valuing the forward looking teachings of the Gurus. It is the writer’s experience that most of those who look out side the community for a marriage partner have little or no understanding of basic Sikh teachings. This is not necessarily their fault and much of the blame often lies with parents unable o r unwilling to distinguish between Sikh teachings and sometimes, negative Punjabi culture. In response to the growing trend of Gurdwaras relaxing Gur Maryada to accommodate the wishes of individuals rather than respect the Guru’s teachings and Sikh Rehat Maryada, the Sri Akaal Takhat Sahib – the Supreme seat of authority of the Sikhs – has issued a Hukumnama (decree) regarding this matter on the 16-8-2007. My opinion regarding interracial and interfaith marriage is different from it. What, I tell the youth at the camps is briefly mentioned below. There should be no racial bias according to Sikh faith, hence, there is no racial bar against a marriage. Regarding interfaith marriages, it should be well understood that they may be performed by two or more ceremonies but such marriages will not be happy ones. Religion is not just a collection of beliefs to be understood but a path of life one decides to follow. Two spouses cannot simultaneously walk on two different paths, i.e. practice two faiths and still remain together as a couple. Otherwise, it is literally a marriage of convenience and not a marriage of minds and hearts. It is not a true marriage where both partners cannot jointly practice their faith, the mission of their life. Without practising faith, we are no better than animals. In case the two belong to different faiths, before they marry they must decide which faith they are going to follow. It may be remembered that conversion for marriage does not mean a change of belief, but it is for a worldly advantage. Such a wedding may soon create problems. Here are two case histories from a dozen interfaith marriages that I know. Each has its own lesson for us to learn. 1. I was invited by the New Jersey sangat for a week long seminar there. My host was a white lady married to a Sikh. During informal conversation at her house, she narrated her experience of their marriage. It is rare to find such honest and sincere people.Â What she shared with me is retold below in her words. “My husband is a great human being. While working for him as his secretary, I liked him. We got married, even though my British parents did not agree with it. Later, when they found my husband to be a nice and noble man and also financially well off, they reconciled with our marriage. They now visit us regularly. Before our relations became normal with them, we started facing other problems. The problem of naming our children was easy to overcome. We agreed to give them both Punjabi and Christian names. The other problems, however, continue. When we go to the church, none of us really benefit from it. He does not believe in Christianity and he just sits there to be with me. My mind remains constantly occupied with the idea that I am forcing one gentleman to sit there for nothing. The same thing is experienced at the gurdwara where our roles are switched. I do not understand Sikh sermons recited in Punjabi. He knows that I am there waiting for the function to be over. 2. There is a different experience of interfaith marriage as well. The conclusion I draw from these two case histories is that one must marry within one’s faith. In case of an interfaith marriage, they must, before their wedding, join one faith and sincerely live that faith to have peace and achieve the mission of human life. « What is the Sikh attitude to marijuana (‘Bhang)? Many ‘Nihung Singhs’ consume this. I am a white lady in the USA married to a Sikh man originally from Malaysia. I was raised Christian, but over time have come to just believe in God and that no one religion is correct. I also have rejected the idea that Jesus is the son of god (basic Christian fundamental). Both my husband and I have similiar beliefs and he is not a extremely religious Sikh. He cuts his hair and where we live there is not currently a Gurdwara. We did live in another city where there was a Gurdwara and would sometimes go, but I don’t understand the Punjabi ceremony. We have a 7 year old daughter and have been married for 10 years. I think there is not a problem with any interfaith or interracial marriage as long as you have the same core beliefs and fundamentals. I do agree that it does become difficult if you wish to raise children in a household with two religions. I think any marriage should establish up front before marriage some key ideals or you will have strife within the marriage. Such things do include whether or not to have children, faith, and family. I actually came across this site as I was searching for participation of a non-sikh in gurdwara activities as our niece is getting married next year. I see a lot of the rehat maryada and Guru Gobind Singh’s 52 hukkams (from which rehat is taken) mention not giving your Sikh daughter to a non-Sikh man, but no mention is ever made of a non-Sikh woman marrying a Sikh man. In your examples you do talk about this, but I personally think we make too big of an issue over this. Firstly, imagine paths…meandering through the woods. Some paths go side by side, with only tufts of grass between them, such that you could straddle them easily for miles. Some converge together for a while and then part. And at no time is it written that you can’t cut through the underbrush between paths and skip over to a different path for a while where it seems to suit you. In Guru Gobind Singh’s 52 edicts he specifically says that a Sikh should learn about other religious disciplines. There are many out there and there are some that are not at all known by most Sikhs. While Sikhs have, overall, learned a fair amount about Islam, Hinduism, and even Christianity over the years, it is usually in an attempt to defend Sikhi, not to actually learn out of interest of the parts of those religions that don’t affect Sikhi. A much-neglected religion is Wicca, where people often believe in a dual sort of god-goddess that come together in union as one, they have many different beliefs than Sikhi and some that are the same or similar. They believe in reincarnation for example. Most Sikhs know nothing or next to nothing of Wicca. Now if I said I’m a Wiccan (female) and want to marry a Sikh male, I don’t honestly think that as long as I respect his beliefs greatly, there should be a lot of strife over religion. I don’t object to my children learning about Sikhi (I already have kids and do teach them about Sikhi), I wouldn’t object to a child with him having his hair kept long *as long as the child wanted it*, but I would also want him to learn some about Wicca, and realize that ultimately it is not fully up to us as parents to decide the path of our children. And if that child looked at my older children, his or her half sisters and brothers, and decided he or she wanted to cut their hair to be like them, I would not want anyone to try shaming that child. There is more to life than whether you’re 100% sikh, especially if Sikhi is supposedly able to accept people of all faiths (ie they say they will but are quite opposed at times to people choosing of their own free will to leave Sikhi…).